It’s not atypical to see a mariachi band at a protest rally in Los Angeles, but a mariachi band made up predominantly of school teachers might be a first. During the L.A. teachers strike, Leticia Garcia, a mariachi violinist and an educator at Belvedere Elementary, took it upon herself to organize a United Teachers Los Angeles mariachi band. “There was so much interest from all us to [help] pick up the morale on the picket lines and show support,” Garcia says. She contacted educators across L.A. who were also mariachi musicians to come together to make some music. 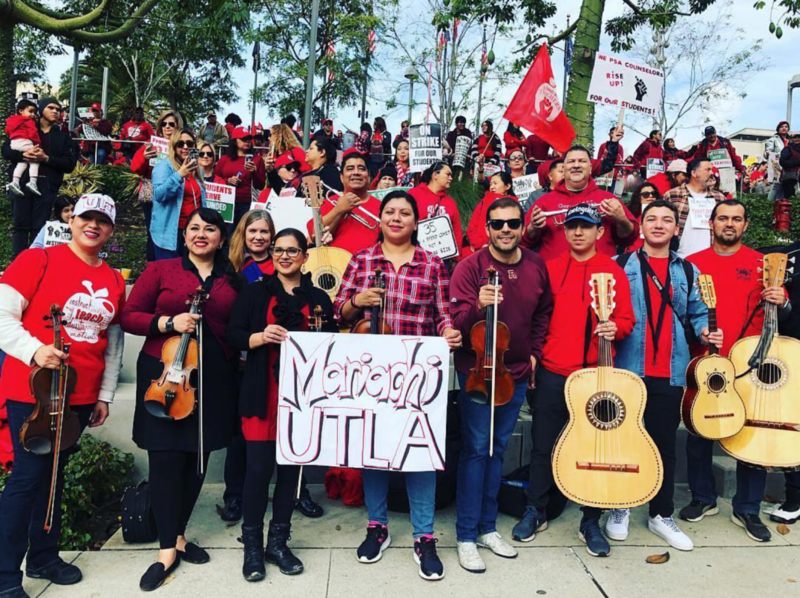 Last Friday, during the union’s big Grand Park rally, the UTLA mariachi band came together to perform for colleagues, supporters, and the community. The band comprises music, special education, elementary, and high school teachers from across the district—from El Sereno to Northridge—and has over 20 names on its roster. Students got in on the action last week, too. Aryana Fields, a fifth-grader at Playa del Rey Elementary School, performed “A Strike Song” in support of striking teachers. And at Delevan Drive Elementary in Eagle Rock, dozens of students stood on a second-story balcony and serenaded their rain-drenched teachers with “Count on Me” by Bruno Mars (you can watch the video here). Gonzalez’s son, 14-year-old Esteban, accompanied his father on the picket lines from day one and was also a part of the mariachi band that UTLA formed. He plays the bass, also known as the guitarrón. Throughout the strike, more prominent (and even legendary) artists from the music world showed up to rallies, marches, and picket lines to stand and even perform in solidarity with L.A. teachers. During the strike, educators also got creative with their dance skills. Using the late Aretha Franklin’s “Respect” as the soundtrack to their #PublicEdDanceChallenge, UTLA members and supporters shared video on social media to encourage L.A. to learn the dance and show up on the picket lines. After six days on the picket lines—through both rain and shine—UTLA reached a tentative agreement with the district yesterday. As both parties announced inside City Hall that a deal had been struck, UTLA members, the L.A. community, students, and supporters began to celebrate outside as Pete Rodriguez’s “I Like It Like That” blared through the speakers.